Bob Geary is boldly predicting that Governor Pat McCrory is toast in the 2016 election. Geary also suggests that all those Republican retirements from the General Assembly have been prompted by the lead-pipe cinch that our Republican General Assembly will be dealing with a Democratic governor, come 2017. I totally agree with Geary on the first point, but I'm not so sure about the second. Republicans love being in the opposition. They're actually much better at opposition than they are at positive governing (witness our current state of affairs). I tend to think that all those retirements signal nervousness about a rising tide that might sink all yachts. They don't want to lose. Losing is very much in the air for the Republican agenda in North Carolina. How much horse dung do you expect people to ingest before they discover a bad taste in their mouths? McCrory convened a private meeting in Charlotte that led, according to official memos unearthed by The News & Observer, to McCrory contributor Graeme Keith's company retaining a lucrative contract to clean prisons, over the objections of prison officials. Keith is quoted as asking for "something in return" for his campaign cash. McCrory claims he didn't hear him because he was talking to someone else at the time. McCrory's Department of Health and Human Services has thrown so much money at no-bid contracts and inflated salaries for Republican cronies—with such dubious results—that U.S. Attorney Thomas Walker has opened an investigation. Under the voucher plan signed by McCrory, the state is sending checks worth millions of dollars to private "schools" that barely merit the name. Veteran state Rep. Leo Daughtry, R-Smithfield, visited one in his district. "It's in the back of a church, and it has like 10 or 12 students. And one teacher. Or one and a half," Daughtry told a legislative committee. "[It] didn't seem to be a school that we would want to send taxpayer dollars to." Under a $650 million contract with the state, a private company has begun adding toll lanes to I-77 north of Charlotte. Toll lanes it will own. Whatever you think of this idea, vast numbers of suburban Republicans in North Mecklenburg and Iredell counties think it's corrupt. They're demanding that McCrory put a stop to it. 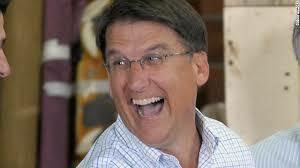 McCrory's position? He let it start, and now says it's too late to turn back. Pollution threatens Jordan Lake in Chatham County, the source of a lot of the Triangle's drinking water. The state spent years developing a plan to attack the problem. But under McCrory, to the delight of lake-adjacent developers, the plan was pushed aside. Instead, the McCrory administration paid $2 million to a company to rent 36 floating "water mixers" for a tiny portion of the lake. After a year, the whirligigs don't seem to be helping—hardly a surprise! The retirements from the legislature only show that some members have gotten as much out of the job as they can squeeze. Watch for many to get into business deals, consulting or other areas as a "thank you" from the interests they pulled together votes for. McCrory will do just fine if he's voted out of office, probably landing some job at Duke Energy, FoxNews or a DC think tank or lobbying firm. He's not worried - if this whole Governor job doesn't work out, he's got "friends" that will take care of him.